Just DjangoNo words needed I think. (Click on the icon below). No words needed I think. (Click on the icon below). So true. He looks a bit like a young Stochelo on the left, although Django's hands are much larger. It looks like he could cover his whole head with his picking hand. His fingers were incredibly long. 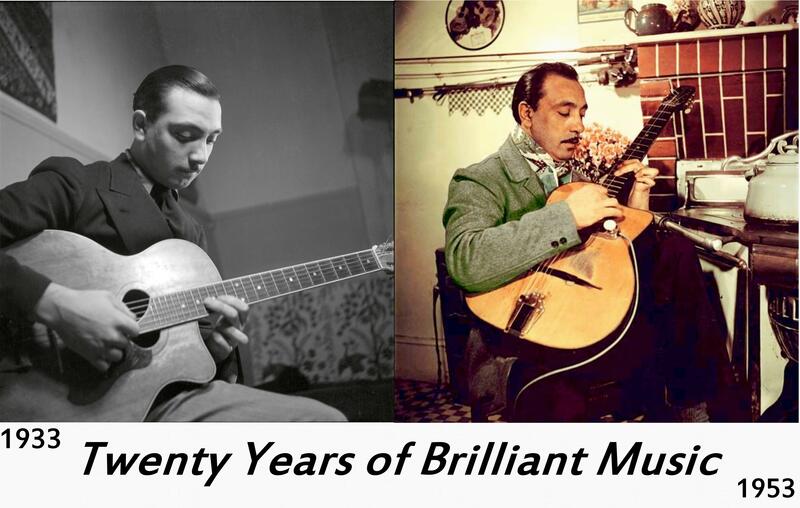 Gypsy jazz is almost enterely based on Django's magic, on Django's approach to harmony, on the way he constructs a solo, on his poetic approach to improvisation, on the atmospheres he builds and on his compositions and repertoire, not to mention his own note for note improvisations, arrangements and instrumentations. 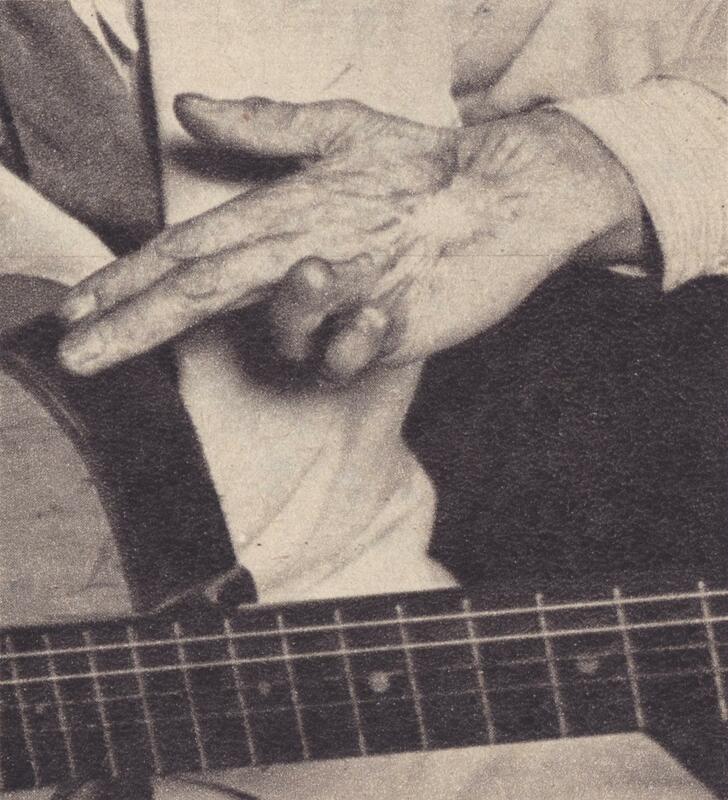 Some of Django's innovations are however absent in Gypsy jazz such as his continuous work on the Sound or his mastery in changing keys during the tunes (Folie a Amphion) or even his hability in harmonically smoothing the standard changes of well known tunes (Just One of Those Things or Charleston or Tiger Rag), or his capacity to change part of the tune from major to minor (The Man I Love) for deeper expressivity necessities, or even his modal evolutions (Appel Indirect and Impromptu among others). There is a perfection, a poetry, a grace, an authority and an energy in Django's forms that immediately gaps all of us. The way gypsies play that music is yet remarquable as they are really at ease in a music that has no contacts with our written world and is built on an oral tradition combined to a different approach to life that makes them capables of plainly living the present disregarding the concept of Future just considered as pure fate. A delicate "parfum" of roses and beer. The new generation goes slowly and generously from Mainstream to Bop indicating that Jazz should however be the reference for more convincing but still future evolutions. Do we remember that for exemple Coleridge Goode was already exploring Free Jazz forms in the Sisties? As Angelo Debarre told once: "What would have we done if Django had not existed?" @spatzo ...those are wonderfully Insightful words you have written. Made my day. Well it is only my opinion about that music but I am afraid it lets no place to some artists such as Bireli Lagrene... Bireli in fact masters all that lacks in gypsy jazz but he hasn't for me the magic Django has in my ears. Of course I am sure he has for many others. Anyway Bireli can't be contained in the GJ's label, he has many times demonstrated he was able and avid to play many other musics. I feel I should like Bireli more than I do because he is an incredibly talented guitarist. However, I have always thought he spends too much time showing us what a fantastic technician he is rather than creating beautiful music. I know I will get a tirade of abusive for saying this but that's what I feel. As Spatzo says - he doesn't reach me. I do not question his talent for a moment though. Teddy, not that my opinion holds much water, but I completely agree with you. A lot of Bireli's stuff pops up on my Pandora station and tried as I have, 90% of it doesn't speak to me in the way the music of Stochelo or Angelo Debarre. No question of the immense talent, bit something is just off enough for me not to enjoy the majority of it. It's a wonderful thing about this style that we have so many wonderful musicians to listen to.